Mizuno's marketing pitch: The lightweight support you need to go farther and longer. Midsole: Compression molded EVA foam, plastic Wave plate. 12 mm heel to toe offset. The new Inspire 12's hallmark is its balanced ride behavior, which was also true for the Inspire 11. Changes? It's put on a lot of weight, improved its fit, and done a few things to its sole design. 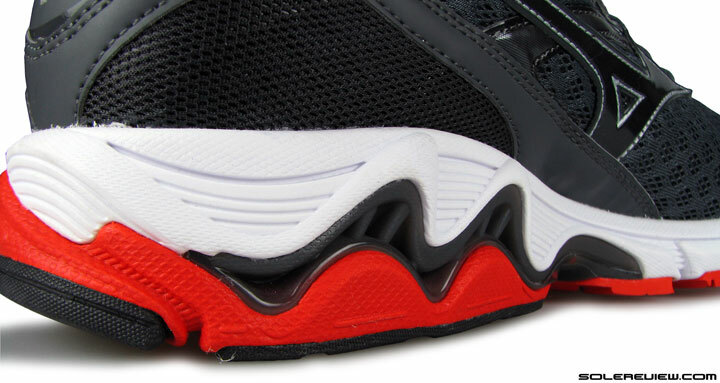 Mizuno’s secret sauce hides in plain sight. Yours truly- the Wave plate. 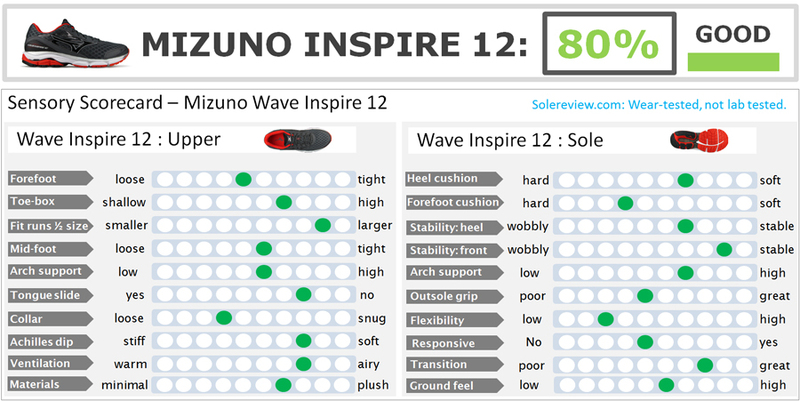 Solereview does not have a great deal of experience reviewing Mizuno shoes, so far limited to a small assortment of models such as recent versions of the Rider, Creation, Inspire, Prophecy, Hitogami and the Sayonara. Nonetheless, one thing is pretty evident. That all Mizunos have a distinct ride signature uniquely their own. If someone were to conduct the running shoe equivalent of a blindfolded Cola test, most experienced runners should be able to tell a Mizuno from other brands. And why’s that? Easy answer. 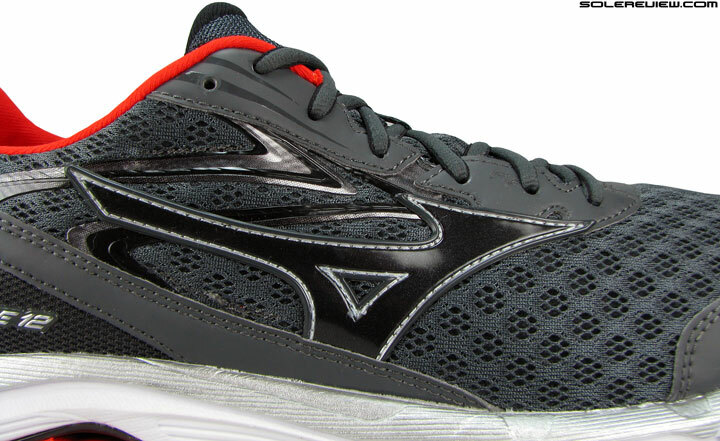 On most of its shoes, Mizuno uses a cushioning tech called the Wave Plate. A hard thermoplastic is injection molded in the shape of a wave, with raised crests and dipped troughs across its length. This component comes sandwiched between softer midsole foam layers, and is designed to perform both as a support and cushioning mechanism. Some models are equipped with a heel-only wave plate, while others feature a longer plate which extends from heel to forefoot. No matter what the design variation was, a common denominator cut across. Which happens to be the firm feel of the Wave midsole, tinging nearly all Mizuno shoes with an unmistakable ride character. What do you know – the Inspire 12 is full of surprises. Given that context, it was somewhat surprising to see the Inspire 12 change a lot from the Inspire 11. For the record, the Wave’s signature feel still threads common across both versions. However, design updates infused around it result in a markedly different ride quality. The Inspire 12’s new upper also receives a few updates, all of which lead to improvements in fit and feel. Perhaps the most telling change of all is the Inspire 12’s massive weight increase. At first, we thought it was a mistake, and weighed the shoes again just to be sure. It goes from 287 gms/10.1 oz (2014 Inspire 11) to 338 gms/11.9 oz, which brings it closer to Paradox 2 territory. Which at 373 gms/13.1 Oz, is the Inspire 12’s bigger brother within the ‘support’ category. There are plenty of reasons why the Inspire 12 gains so much mass, some of which are the same factors why the shoe feels different to run in. And is this good or bad, both the ride and weight changes? Hard to judge. Our viewpoint is limited to comparing only the Inspire 11 and 12 (which we’ll do anyway), so that might not be a very well-rounded perspective. The Mizuno Wave Inspire goes back more than just a few years, so perhaps the Inspire 12 brings back something which the earlier versions (8,9,10) had? Or maybe not. We don’t know. All we can do is tell you what has changed from last year, and that the shoe maintains its ‘Mizuno-ness’ – for lack of a better word. The Inspire 12 does a few things differently from the 11, that’s all. The 2014 Inspire 11’s upper was a very minimal affair. Save for the synthetic leather toe-bumper, lacing eye-stay and other small bits and pieces the upper was nearly all-mesh. This was true for all 2014 Mizuno models, because the entire product line adopted a rather peculiar design approach. All the Mizuno models we reviewed in 2014 and 2015 had the same upper design. Which meant that except for the model specific variations in fit, ride, material and color, the basic upper template looked exactly the same across the line-up. Unlike 2014, when nearly all Mizuno models shared the same upper design template, the 2015-16 versions come with distinctive uppers. Mizuno changes that on the 2015-16 assortment. The Inspire 12 does not look like the Wave Rider 19, nor does the Sayonara 3 look anything like the Paradox 2. Each model now comes with a visually distinguishable upper design, which makes things a little more exciting. The Inspire 12 gets a new set of clothes. The toe bumper? Longer on either sides than the 2014 Inspire 11. In the Inspire 12’s case, the upper arrives with greater layering. Synthetic leather panels flank either sides of the midfoot and wrap around the heel. The toe bumper also extends its coverage over the mesh, with increased height and medial side length. Add to that unseen upgrades inside the upper. Roomy toe-box, but that’s not the point. The white fabric stuck to the underside is. The toe-box gets a beneath-the-skin update. 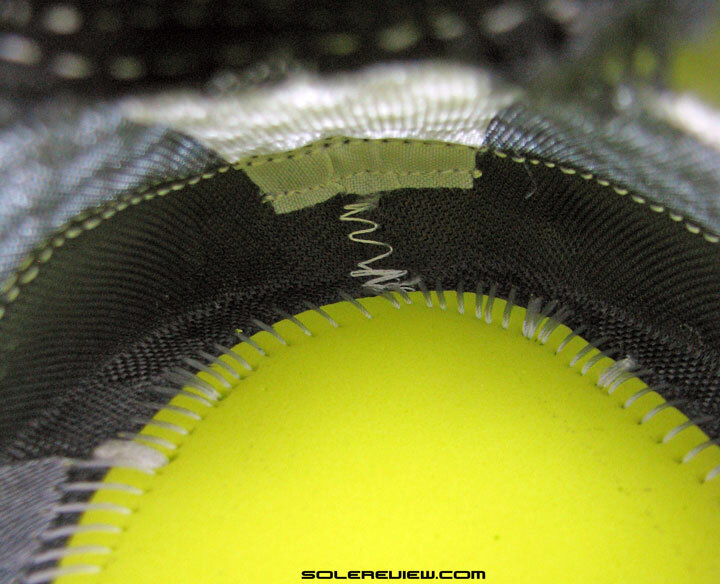 A tape-like material lines up the inner toe box in shape of a broad strip, which runs from the start of the lacing to the tip of the Inspire 12. You can feel it when you touch the inner lining with your fingers – the presence of a crinkly material just below the forefoot mesh. This is the same fabric used in the eye-stay lining; a white woven tape. 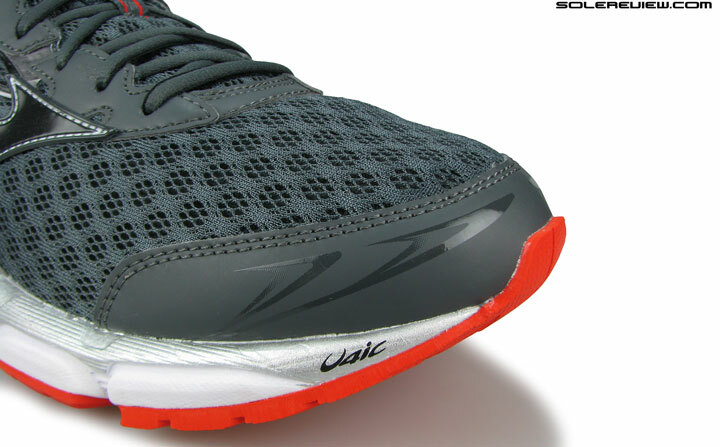 And why could be the point of this – raising/elongating the toe-bumper and reinforcing the mesh? We suspect that the real reason is not to adjust the fit, but rather to make that portion stronger. Agree. I have worn the WR 13, 15, and 17 and once tried the Inspire. I actually preferred the cushion of the Inspire, but not the stability features. All of Mizuno’s changes seem “curious.” It seems they change for the sake of change. The WR13 was preferred by many and never has been the same. Personal thought, it seems Mizuno running shoes are not the focus of the company. Their golf, baseball, and other sports seem to be the foundation for the company. The previous year’s models can be found at very, very cheap prices (possibly indicating a lack of sales) as compared to Brooks, Asics, and Nike. Perhaps this is the reason why Mizuno is making their shoes softer? To appeal to a mainstream audience? Mizuno’s lack of popularity is indicative of the minimal replies to this review compared to other reviews. Can’t help but feel that this version of the Inspire is not true to this shoe’s heritage. All models since the 6 (yes, I’ve used them for a long time) have had the 11’s “snappy” responsive ride. WHen I tried the 12 at my local shop it felt too similar to the Paradox. consequently I bought a pair of 11s on run-out. Will try to source some more of these, as I didn’t like the 12’s bulky feel. Thanks for the feedback – have no idea at all about Inspires before V11. hey i had ankle operation (ATFL) and used puma FAAs1000 after that which seemed quite comfy. then i started using the reebok ziglite. both shoes on treadmill or soft ground and nothing more than 5k…however i started developing shin pain i think because of the ziglite. even though the ankle is fine now the knee of the other leg plus the shins trouble me… i am looking foe anew shoe to gradually build up for a half marathon….have read so many reviews that i am confused…any suggestions would be greatly appreiated.. Sorry Rudra, we cannot help here – injuries might or might not be caused because of footwear. It is best to see a physio for ways to treat your pain. I’ve run in the Inspire 8, 9 and 11 and loved them all. I recently tried the 12 on in a store and felt that my heel was slipping. I compared the 12 side-by-side with my 11 and they definitely looked about a half size larger. Just to be sure about the heel slippage issue, I also tried a half size smaller and still felt that my heel was slipping. I know your review indicated that the heel area hasn’t changed from the 11. Looking at pictures of the 12 and the 11, the last eyelet in the 12 seems farther away from the heel than in the 11. Could that be the reason why my heel feels like it’s slipping? I also tried on the Guide 19 at the store and felt that my heel was slipping, albeit not as much as the Inspire 12. Bottom line is I didn’t feel comfortable in the Inspire 12’s and I don’t know what to do now. Years ago, I ran in Asics GT-2000s, but they seemed slow once I discovered the Inspire series. I also tried Sacuony Hurricanes but they felt like concrete blocks on my feet. It is possible that the softer insole is causing the foot to sink in further, creating the sensation of slippage. Have you tried the Sequence 8 Boost? Thank you for the feedback! We currently don’t write outdoor footwear reviews because of resource constraints, but once we do, we’ll be happy to get into trail running shoe reviews! Thanks for the great reviews! I tried Odyssey but it was a disaster for me. One source that has great info on running shoes is this one https://www.youtube.com/watch?v=tQBKVeA_qrI, they are quite thorough and combined with your analysis, this is a great help to all of us. They suggest Saucony Ride 7, like you did, which I might try. Great job with the site, thanks for all the reviews!!! I’ve been running with Lunar Eclipse (v3 and V4 for the last few years). It’s a shoe that I liked and felt comfortable with, even though I’ve always suffered from shin splints. I’ve managed to keep them at bay by using a MacDavid calf sleeve… otherwise I would start getting pain in my shins after 3-4 runs without using them. Recently I had to shop again for new shoes, but the Lunar Eclipse are gone. So I tried several pairs (including the Nike Air Zoom Odyssey) and ultimately settled for this Inspire 12, they felt the best at the store. After two months of use I’m developing ITBS and also for some reason my toes are hurting at the tip (surprising since one of the reasons I chose them was the roomy toe box). I had never had any of these issues before, so I’m blaming them on the Inspire 12… even though I’ve run my first marathon during this time. So now after the marathon I’m slowly getting back to running and working hard on my running form in the hopes of getting rid of my shin splints once and for all (I’d like to run without the calf sleeves!). In the process I want to go a bit more minimalistic with my shoes to see if that’s also a factor that will help my form and running economy. Any recommendations for a new pair of shoes? I get the Inspire 12 at Roadrunner so I can still exchange them for a new pair. Thanks so much in advance! How much of running were you doing before the marathon? Besides the shoes, overtraining could potentially be an issue. That said, if you’re looking for a relatively minimal shoe, then the New Balance 1500 V1 or V2 is worth a try. I had been training Ning for the marathon for a while, and I got the Mizuno’s just as I was about to start the tapering, like about 3 weeks before the race. They felt good at first, but after a few runs I got pain in the top of my feet, so I had to change the traditional lacing which helped… But the more I run in them the more I noticed they weren’t right for me… And then those issues appeared. I’ll look into the NB 1500… I was also thinking of the Saucony Kinvara or Ashoka Clifton as potentially good transition shoes… Any thoughts on those? And maybe a Nike equivalent if you can think of one? Thanks!!! Apart from the 1500, you could try the Nike LunarTempo 2. Yes, the Kinvara is also worth considering. The Clifton? Not sure. You mentioned minimalist, but these shoes are anything but.